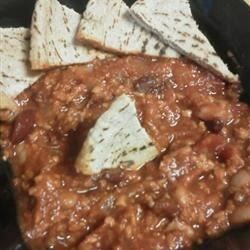 "This is a wonderful vegetarian recipe from the Cornucopia Restaurant which was in South Bend, IN. It makes a very large pot of chili. Freeze leftovers for a future meal, or cut ingredients in half for a normal pot of chili." Place beans in a large saucepan, and cover with water. Soak overnight in the refrigerator. Drain, and return to pan. Add 9 cups water; cook for 1 1/2 hours, or until tender. Meanwhile, mix textured vegetable protein and boiling water together in a large bowl. Set aside. In a large saute pan, heat oil over medium heat. Add onions; cook and stir until soft and translucent. In a large stock pot, combine beans, textured vegetable protein, onions, spices, salt, honey, molasses, chili sauce, tomato puree, and diced tomatoes. Stir to mix well. Simmer, stirring often for at least 1 hour. Very tasty. I didn't soak the beans, it saved me some time - however, those who have sensitive stomachs should soak them.